On this page you can see all the content, which is already available in English. The DelphiX Image Library Editor - This editor has most of the features from other DXG Editors and is easy to use. 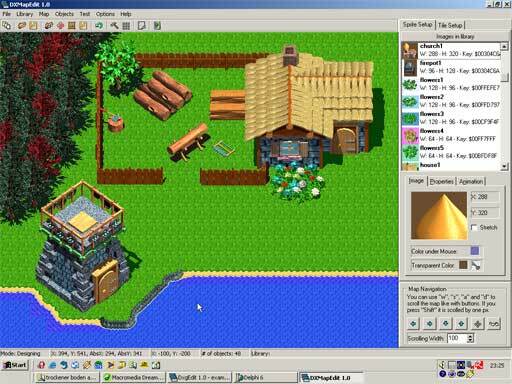 DelphiX Map Editor - With this program you can create 2D maps easily. Just load a DXG file and put the sprites on the map everywhere you want. You can also edit the background tiles. To load a map into your game simply use the component. A pre-alpha version of the component is included in the package. Note: The best is if you use an extra DXImageList for the map component as the images are located by index by default. You can force the component to get the images by name (set "GetImagesByName" to true) and mix the DXImageLists but it is not recommended. The Sprites unit in the component package is used as interface unit for the Map Editor and the DXMap component. Bind the above inserted objects to the DXMap object by setting up the values for "ImageLibrary" and "SpriteEngine". Load a Map created with the Map Editor by calling the DXMap.LoadMap procedure. The best ist when the map and the image library are in the same directory as the image library will be loaded automatically. If the component can't locate the image library it calls the "OnImageLibraryNotFound" event to let the user search for the file. Use the "DXMap.LibName" function to specify the full path to the right file and set "Handled" to true. Don't forget to call the "DXSpriteEngine.Draw" in your DXTimer event to let the sprite engine dislpay the map. You must load a image library first. To put an object select the sprite in the listbox on the right (make sure page "Sprite Setup" is active) an go to the map window. Press left mousebutton to put it. Strg + left mousebutton selects an object already on the map to modify it. In modification mode you can delete the object by clickin right mousebutton. Right mousebutton exits current action (e.g. see above). To put multiple sprites press Shift + left mousebutton. You can select the transparency in the preview window, when the cursor is a cross (f it does not have one or not the right one). To insert a background go to the map properties (the hammer) and select a image. You must also choose between tile (tiles the image resp. the pattern) or define a map size. Then press update to changes take effect. If you want to set up the background tiles go to the "Tile Setup" page and select in the combobox an image with more than one pattern (if you have already used the map properties dialog, the selected image will be used as default). To define an other image select it in the combo box and press update. If it as patterns select also the pattern height and width below. The available patterns are shown below in the listbox. Select on an go to the map window. Left mousebutton sets the tile, right mousebutton aboards the action. Load and save already work, but the file format ist not defined. It may be modified in the next version. If you select save map you are automatcly prompted to save the library too (the images of the objetcs are only references to the images in the library). The animation tab is not implemented yet. If it is included the animation will be already visible in designtime. Undo only works with objects and not with tiles. You can undo untill there are no more objects available. If you doesn't understand some buttons in the tollbar use the menu.